As you can see, I went a little over board with all the apple purchases lately. I didn’t think I’d really need the wireless keyboard considering I got a wired one with the number pad. Yet, here I am, lying back on my bed, typing away. I’m a little far from the screen, so can’t really tell if I’m spelling everything correctly. I guess I’ll spell check later. 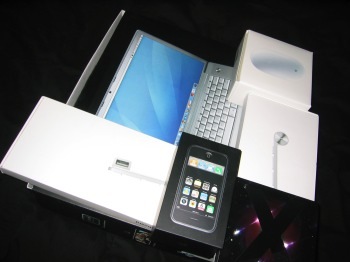 Yes, I was one of those that made fun of people that bought apple computers. Then, apple built OSX on top of UNIX. My first eyebrow went up. They moved to intel….. the other eyebrow went up. The hardware got prettier, and I was sold. I dig the whole minimalist metal look. It’s not all good though, I despise the mighty mouse. Big waste of money, don’t even bother. The wired one is OK, but the bluetooth version, for me, is extremely hard to control. It just doesn’t go where you want it to. I exchanged it to make sure it wasn’t defective. The problem didn’t go away. I’ve since gotten a Logitech wireless mouse, and all is well. A few things have happened since the 4th of July, and I’ll get around to writing about them in detail eventually. My G&G shoes came in, I’m hanging out with my coworkers more, I got a monster Schott jacket (Cafe racer style), signed up to netflix finally, tried fried chicken and waffles, did a same-day Lombardi’s VS grimaldi’s pizza-off, got a work-laptop image to function in vmware,on my Mac, VPN and everything. The last was a month-long difficult ordeal!